The Savannah Belles Ferry fleet includes four very distinct vessels; each named for noteworthy women of Savannah’s history. 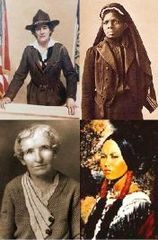 We have the Juliette Gordon Low, the Susie King Taylor, the Florence Martus, and our newest Belle, the Mary Musgrove. Juliette Gordon Low (1860-1927) founded the first American Girl Scout troops in 1912, in her hometown of Savannah, GA. The Girl Scouts are committed to promoting strong leadership and decision-making skills among young women. Susie King Taylor (1848-1912) lived in Savannah and gained her freedom from slavery at the age 14. She contributed to Civil War efforts by serving as a nurse to the black soldiers and by teaching them to read and write. She opened one of Savannah’s first schools for African-American children. Florence Martus (1868-1943), known in Savannah as the ‘Waving Girl,’ was the daughter of an ordnance sergeant at Fort Pulaski who took it upon herself to become the unofficial greeter of ships into Savannah. Legend has it that not a single ship came in to port without her waving her white handkerchief or lantern at it during a 44 year span. Her statue continues to greet visitors to the port from Morrell Park on the riverfront. Mary Musgrove (1700-1765), a Native American, served as an interpreter for General Oglethorpe during the founding of Savannah. She played a crucial role in negotiations with Tomochichi and the Creek Indians, convincing them to peacefully accept the new colony in their territory.